The UK advertising industry has bravely decided it can continue to accept millions of pounds from the state to create alarming climate advertisements, despite inaccuracies and a storm of complaints from parents. The principled decision, from the admen’s self-regulatory body the ASA, follows 939 complaints about the UK energy ministry DECC’s “Drowning Dog” prime time TV and cinema ad (aka “Bedtime Story”) , which cost £6m, and four related posters. Critics aren’t happy, and point out that the chair of the ASA, Lord Chris Smith of Finsbury, also chairs the Environment Agency, and is currently working closely with DECC. The ASA dismissed complaints against the TV ad, although it upheld complaints against two of the related poster advertisements, and has requested they not be run again. On the charge that the campaign was political, ASA deferred to OFCOM, which is continuing to investigate the advertisements, and has not yet made a decision. The TV and cinema ad predicted “awful heat waves” and “terrible storms and floods” for the future, claiming that life would be “very different in 26 years” if people failed to make decisions such as living in colder houses, or using less transportation. The ASA examined ‘Drowning Dog’ on the grounds it was misleading, was not based on objective evidence, and caused unnecessary personal distress. In its defence, DECC cited reports from the UN’s IPCC panel, and the ASA agreed there was an “overwhelming consensus in the global community of climate scientists” backing this particular climate theory. The ASA believed the IPCC to be objective and independent, and concluded there was “not a significant division of opinion” amongst scientists on the theory. Therefore, the ASA found that “the level of discomfort was proportionate to the risk”. It also noted that as the child’s (cartoon) dog drowned, “the child showed wonder rather than fear or distress”. An appeal to fear is justified in the CAP Code’s marketing guidelines, said the ASA. The ASA panel said that to reflect the computer models from which the predictions originated, but said they were justified. Because the claim “over 40% of the C02 was coming from ordinary every day things like keeping houses warm and driving cars” was preceded by those qualifications and was accompanied by images of human activity in a typical UK town, such as cars driving along streets and lighting in houses, we considered it would be clear to most viewers that the ad was discussing increasing levels of C02 and that the claim “over 40% of the C02 was coming from ordinary every day things like keeping houses warm and driving cars” referred not to total C02 in the global atmosphere, but to C02 produced by human activities in the UK. Posters produced by the Energy ministry didn’t fare so well. A poster ad titled “Rub a dub dub three men in a tub, a necessary course of action due to flash flooding caused by climate change” and another titled “Jack and Jill went up the hill to fetch a pail of water. There was none, as extreme weather due to climate change had caused a drought” (really) were felt to be insufficiently tentative. 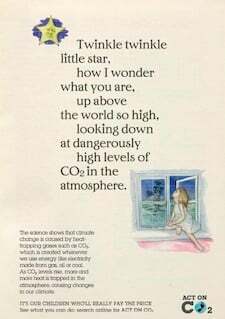 Two other posters, one titled “Twinkle twinkle little star; how I wonder what you are, looking down at dangerously high levels of C02 in the atmosphere” and another titled “Hey diddle diddle, the cat and the fiddle, the cow jumped over the moon on discovering just how easy it was to reduce our C02 emissions” were deemed acceptable. One complainant, who declined to be named, expressed amazement to us at the decision. Energy ministry DECC paid for the campaign, which is under an umbrella initiative called Act on CO2. Documents seen by El Reg refer to the wish to make Act on CO2 “the premier government-backed behaviour change brand”. But is behaviour really changing? The complaints were made in October, before the Climategate archive leaked onto the web, prompting a series of stories showing claims by the IPCC on ‘impacts’ of global warming on rainforests, hurricane activity and glaciers, were exaggerated. The expensive ads may not be working: since the campaign began, public skepticism on the theory has increased significantly. Russ Lidstone, chief executive of the advertising agency Euro RSCG is having second thoughts. The poll showed “great cynicism now as a result of questions in popular culture and regarding credibility of IPCC data” and said the public was becoming “desensitised” to predictions of extreme impacts. There’s an interesting interview with ASA chairman Chris Smith in the Times, describing him as a “green revolutionary” who is working closely with the subject of the complaint, DECC. Previous PostPrevious Why BBC3, BBC4?